Game Warden Daniel Roraback has been named the 2013 Texas Wildlife Conservation Officer of the Year by the National Wild Turkey Federation. A 2009 Graduate of the Texas Game Warden Training Center, Roraback is currently stationed in Red River County in northeast Texas. In addition to his regular duties, he organizes youth hunting events and teams with Oklahoma wardens to enforce regulations on the Red River, while maintaining a high conviction rate for violators. He has joined department’s highly specialized SCOUT team and serves as a Glock armorer and a role player for simunitions training. 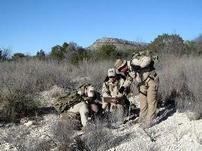 Texas Game Wardens have become even more adept at special operations and collaboration with local law enforcement. Read “Ready to Rescue” as told in the latest Texas Parks & Wildlife magazine. Check out case stories like ‘Tag, You’re It’ and ‘South Texas Peyote Bust’ about law enforcement with a conservation approach in the latest Game Warden Field Notes to stay in touch with the activities of our dedicated wardens. For up-to-the-minute news on law enforcement off the pavement, follow Texas Game Wardens on Facebook or Twitter. Share the link to the Texas Game Warden web page with someone who might want to be a Game Warden. The first five canine handlers and dogs have graduated from an intense eight-week training program located at the world famous Utah POST canine facility in Salt Lake City. The second wave of canine handlers and dogs will attend the course in January 2014. Meet some members of the new team in this video. “The K9 program has been a long time coming, and we are extremely proud of our handlers for their hard work,” said Grahame Jones, Chief of Special Operations for the Texas Parks and Wildlife Department Law Enforcement Division. “In addition to excellent support from the department and the Parks and Wildlife Commission, we would like to thank the Travis County Sheriff’s Department, Texas Department of Public Safety, Florida Fish and Wildlife Conservation Commission, and the Texas Parks and Wildlife Foundation for assisting during the planning." Read more detail in this story. The dogs will help wardens with detection of illegally taken or smuggled game and fish, search and rescue, cadaver search, and narcotics enforcement. Read the latest Game Warden Field Notes for descriptions of what game wardens have encountered recently in the course of their daily work. Enjoy your photography hobby at a Texas state park and enter your best shot in the 2014 Texas State Parks Photo Contest for a chance to win a HERO3+ Silver Edition GoPro® video camera, a $300 retail value, from Whole Earth Provision Co. AND have your photos featured in Texas Parks & Wildlife magazine. Whether you like to casually spy on the birds from your favorite park bench or consider yourself a birder with enough skill to compete in the Great Texas Birding Classic, April is an especially great time to watch for migratory birds traveling north through Texas as well as our resident species. Visiting a state park? Many parks offer a birding checklist. Food tastes better outside, so try a picnic. Pick your setting at a Texas state Park: near a river, lake, cave, canyon or beach. Pick your seating: on a blanket, at a picnic table, or on a sun-warmed rock. 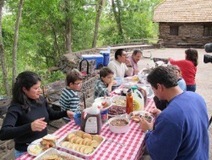 Pick your menu: Try these recipes and find more on the Picnics and Outdoor Cooking Pinterest Board. Also check out the Dutch oven enchilada recipe that recently won the Outdoor Cooking Contest. Ever need regulation answers while you’re in the field? 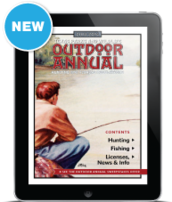 If you're an iPad user, you can now download the iPad Edition of the Outdoor Annual for an easy way to take Texas hunting and fishing regulations with you. It’s free, and no internet connection is required to view it after initial download. Find it on iTunes and the Apple App Store. 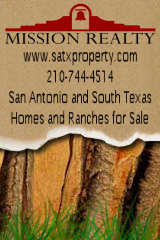 A link to the download can also be found on the Outdoor Annual web page. The Battleship Texas, veteran of two World Wars and the only remaining dreadnought battleship, turns 100 in 2014! Join her Centennial Celebration, Saturday March 15 featuring Robert Earl Keen and friends Reckless Kelly, Kelly Willis and Bruce Robison, and Charlie Robison for “A Texas Uprising.” The full-day festival for the entire family will also feature educational exhibits, a World War I and II historical zone, Texas Parks and Wildlife Family Zone, concessions, and a fireworks display. Learn more about the Battleship Texas, find event details, and buy tickets online for this day to honor surviving crew members and to help fund the big-gun battleship’s restoration and preservation. The Battleship Texas State Historic Site is open 7 days a week, and the ship has her own exhibit at Bob Bullock Texas State History Museum in Austin through April 13.